From the Founding to the present, Americans have always expressed a distrust of political parties. Hardly a day passes without someone’s—the president, a Senator, a Representative—attacking politics in Washington for the spirit of partisanship. If only elected officials, they sigh, would set aside their parochial, partisan interests, Washington could get down to the important business of doing what is best for America. For instance, in 2011 President Barack Obama said that Washington D.C. suffered from the “worst kind of partisanship, the worst kind of gridlock.” Of course President Obama and others make these complaints as members and leaders of their own parties. This complaint assumes that parties are powerful forces exercising immense influence over the behavior of those we elect to govern on our behalf. The reality is somewhat different. Complaining about partisanship is always good politics, but it is not clear that parties are as powerful as we think they are or that we could or would want to live in a world without political parties. The Founders, as many complaints about partisanship point out, hoped for a nonpartisan system where candidates would be elected based on their individual merit. Parties, the Founders feared, would either try to undermine the Constitution or foment unnecessary political animosities by “agitating in the community.” Parties could undermine presidential and congressional functions. A president might sacrifice his independent judgment to appease his party. And congressional deliberation could be undermined by representatives voting based on a party platform rather than the public good. Despite these misgivings, party competition developed early in America. In George Washington’s own presidency, party competition developed between Federalists and Democratic-Republicans. In fact even as he decried the “baneful spirit of party” Washington was lending his support to the Federalist Party. With Jefferson’s victory in 1800 the Federalist Party declined and became largely ineffectual after 1816 which led to a nonpartisan period known as the “Era of Good Feelings” (1817-1824). This superficial political comity masked problems that the election of 1824 exposed. Without parties nominating candidates, four major contenders, John Quincy Adams, Andrew Jackson, William Crawford, and Henry Clay, sought the presidency, but none could win a majority in the Electoral College. Adams received 84 votes, Jackson 99, Crawford 41, and Clay 37. This sent the election to the House of Representatives since the Constitution mandates that when no one receives a majority of votes in the Electoral College the House selects the president with each state delegation receiving one vote. After going to the House, John Quincy Adams “won”—only to be accused of making a corrupt bargain by Andrew Jackson. The constitutional dangers exposed by that election led Martin Van Buren to propose an argument for a two-party system which changed America’s attitude towards parties and led to the establishment of permanent two-party competition. Van Buren argued that our constitutional system actually required party competition in order to function effectively and fulfill the aims of the founders. With two-party competition elections would not be decided by the House since one candidate would always win a majority in the Electoral College. Having a winner decided by the Electoral College would in turn ameliorate concerns about the legitimacy of the election and therefore the legitimacy of the president. Parties would also help control political ambition. In a non-partisan system, demagogues would have an advantage over statesmen. The Founders hoped to prevent practitioners of the low and “vicious arts” of politics, even though they could be vicious themselves, from being elected. Without political parties regulating nominations it paid to practice those vicious arts. Van Buren argued that fulfilling the Founders’ vision required parties to serve as a mediating institution to limit the effect of demagogic appeals. Political parties also perform an educational function. It is impossible to expect to know how every candidate stands on every issue. When parties are organized around distinct governing philosophies, voters can get a general sense of candidates’ positions based on their partisan affiliation. And out of self-interest and concern for the common good political parties try to convince voters to support their candidates. To do that they must give voters information about why their agenda is better than the opposing party’s. As a result, voters become better informed. Parties thus inject intelligence into the voting process. This educational function is so important that some political scientists question whether mass democracy could function without political parties. One very important controversial feature of party competition in the United States is that it has always been two-party competition. In fact, since the 1850s it has been the same two parties, the Democratic party and Republican party. Other western industrialized democracies typically have multi-party competition. Some critics, often disappointed third-party candidates such as Ralph Nader, have argued that the two major parties have conspired to prevent third parties from winning. The reality is not so dramatic. The American system simply lends itself to two-party competition because of single-member districts and “first-past-the-post” elections. This means only one-person wins House and Senate races and that person is the one who receives the most votes. A third-party candidate could receive twenty percent of the vote but would win zero percent of the power. This creates powerful incentives for candidates to seek election through one the two major competitive parties. In contrast, in parliamentary systems seats are allocated based on the proportion of votes a party receives. If a party receives twenty percent of the vote, it will receive approximately twenty percent of the seats in parliament. This allows third parties to potentially wield substantial power. Often no party receives a majority of the vote and forming a government requires creating a coalition among parties. Minor parties could be crucial for forming a majority coalition, which would allow them to extract significant concessions and cabinet positions. Third-party candidates, such as Ross Perot, often run because they believe that the Republicans and Democrats are not adequately addressing important issues. In the United States, the major political parties have an incentive to reach out to third-party voters. Historically when third parties have formed and received substantial support, both major parties have attempted to draw their voters. But that is not a conspiracy; it is just self-interest. American parties, compared to parties in parliamentary systems, are diffuse and less ideologically pure. Historically American parties have been “big tents” which have included a variety of factions and ideological interests. Thus they have been willing to bring more groups into their fold. 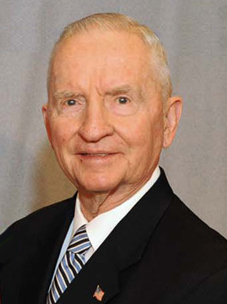 Ross Perot’s Reform Party attracted a large number of voters in the 1996. Both parties made overtures to those voters and by the 2000 election the Reform Party ceased to be a serious force. Subsequent research showed that most of the party’s voters moved to the Republican party. One area of American political life that sometimes seems free of party competition is local politics. As the result of early twentieth-century progressive reform movements many local jurisdictions made their elections officially non-partisan. Of course, it is often quite easy to identify the partisan leanings of candidates even when their party identification is not listed on the ballot. More fundamentally, local issues sometimes cut across or even bypass partisan and ideological lines. Basic quality of life issues such as law enforcement, education, transportation, and sanitation that are often the focus of local policy making do not always seem to lend themselves to partisanship. Where to put a new sanitation treatment facility, for instance, is not necessarily an issue that one could expect guidance from in a national party platform. That does not mean that local politics is free of rancor. It can be just as contentious as state and national political politics, but the contentiousness is not traceable to parties. Political parties have seen their power decline over the course of the twentieth century. Changes to the nomination system and campaign finance regulations have made it increasingly difficult for parties to control their message. Moving from a convention to a primary based nomination system opened up the process to self-selected candidates. That allowed insurgent candidates outside a party’s mainstream to secure nomination and were, thus, less beholden to their political party when in power. Now candidates often completely bypass their party and form their own independent campaign organizations when running for president. Campaign finance regulations also made it more difficult for parties to raise money. This undermined their ability to engage in party-building activities and to support their candidates. The effect here has actually been to strengthen interest groups at the expense of parties. Since donors are limited in how much they can donate to parties, they have created independent groups to support candidates and issues. MoveOn on the left and American Crossroads on the right are two of the more significant organizations that have formed in response to these restrictions. While returning to the system prior to political primaries and campaign-finance reform is not possible, it is worth considering how political parties have helped our system to function and how that role could be strengthened. Political parties historically helped forge ties across institutions and levels of government while not undermining separation of powers and federalism. Parties then allowed for cooperation and coordination. With the decline of parties our institutions have become even more divided leading to even more complaints about gridlock, which allegedly is caused by rampant partisanship. Thus while politicians decry partisanship, the measures they take to weaken parties actually exacerbates the problems they claim are caused by partisanship. Returning some control to parties over nominating candidates and funding campaigns could very well have salutary effects. Video: Why Do Politicians All Sound the Same?